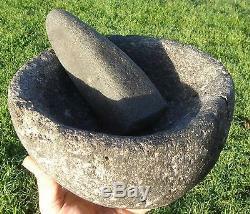 MORTAR & PESTLE: SAN CLEMENTE ISLAND, 19. Weight: 9 lbs 15.2 oz. 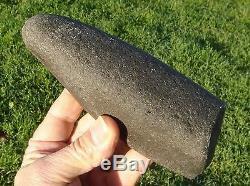 Ninety miles west of San Diego, on San Clemente Island, back in the 1880s, an early rancher stumbled upon this remarkable stone mortar near an eroded, shoreline cove. 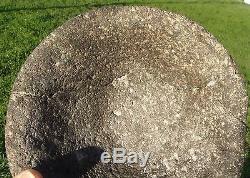 The artifactas well as several other stone mortars and. 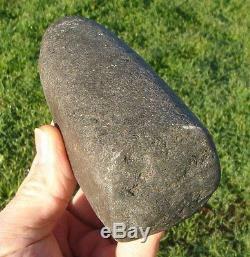 Hardstone tools-remained in the family until acquired by collectors in the early 20. 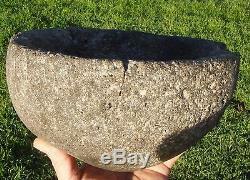 The listed artifact is a deep stone mortar with sharply sloping sides. 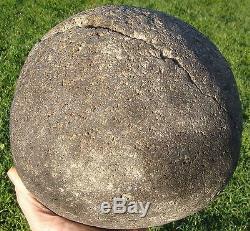 Multiple soil abrasion scars dings, ancient chips, nicks and extraction marks can be seen. The mortar was clearly repaired well before it was acquired by this site. 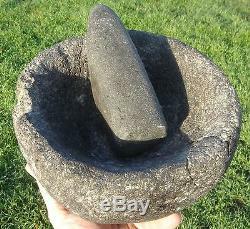 The associated pestle is tapered at one end--for easy, hand-holding. The blunt end shows evidence of crushing and grinding within the bowl depth. 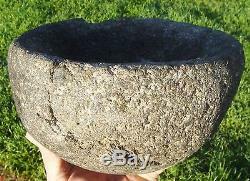 The deep grind area suggests this bowl was probably used to grind nuts and smaller items as the objective in pulverizing these morsels was to dramatically increase their surface area, converting such into powderthe better to mix with other foodstuffs. The repair work on this mortar necessitates a relatively low starting list. 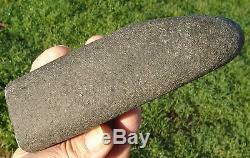 That said, this artifact is a wonderful example of prehistoric California stone making. The delicate nature of this remarkable artifact necessitates double boxing with an abundance of packing material. Look past the crack and focus on the overall integrity, form and astonishing carve-work of the ancient for this Mortar & Pestle! 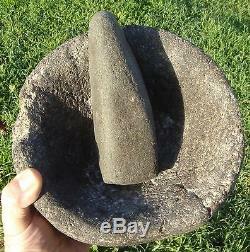 The item "MORTAR & PESTLE- VERY DEEP SAN CLEMENTE ISLAND, 19th Century Find" is in sale since Sunday, January 17, 2016. This item is in the category "Antiques\Ethnographic\Native American".